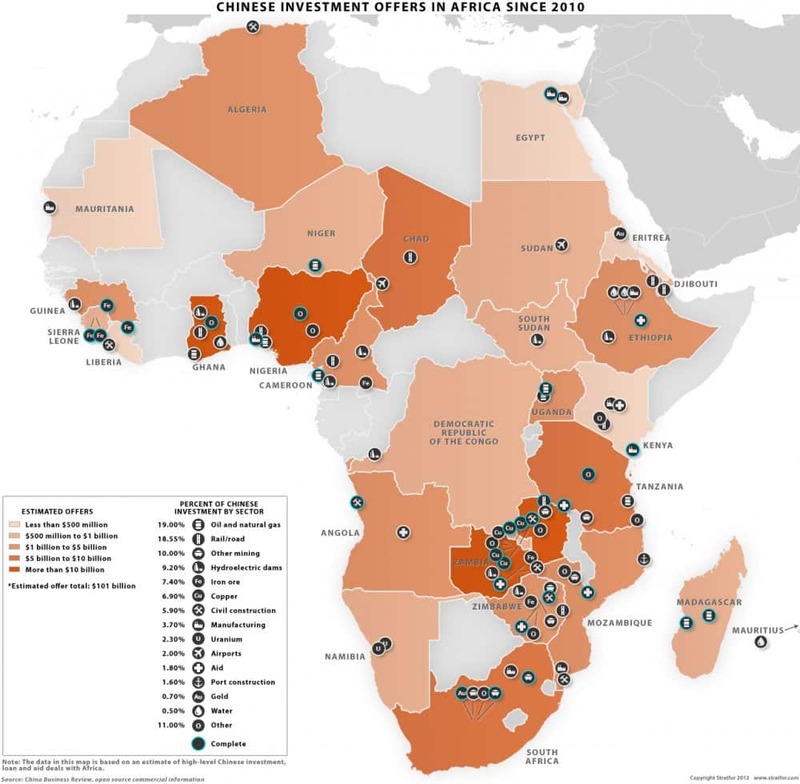 Chinese investment funds in Africa - Africa M.E. According to the latest China-Africa Economic and Trade Cooperation White Paper published in 2013, cumulative Chinese OFDI (outward foreign direct investment, showing the total accumulated value of assets) to Africa amounts to US$21 billion (by official figures). Statistics published by Chinese Ministry of Commerce show that Chinese yearly OFDI flows to Africa increased sharply from $317 mn in 2004 up to $2.52 bn in 2012. Chinese premier minister Li Reqtang, while his official visit to Africa in 2014, predicted that Chinese OFDI to Africa will reach $100 bn by 2020. Since 1983 until 2007, raw oil consumption in China had increased 3 times, and power consumption more than 2 times. China consumes 30% of the world’s supply in minerals. “The rapid growth of the manufacturing sector has also created increased domestic demand for natural resources, including oil and gas, precious metals, aluminum, cooper and iron ore. These are natural resources Africa has in abundance”, say Thompson Ayodele & Olusegun Sotola in their thesis “China in Africa: an evaluation of Chinese investment”. Raw materials amount more than 80% of Chinese import from the African countries. 69% of these raw materials is oil. Metals are other 10%, and only 10% are other products, according to “The Economist” data for 2010. China imports oil, iron ore, copper, cobalt, phosphates, platinum, coil, wood, cellulose from Africa. Only 6% are hi-tech products. 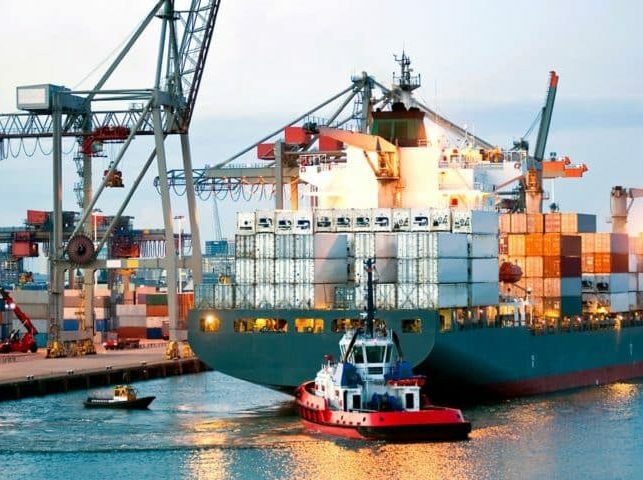 Major suppliers of China in Africa are: Angola, South African Republic, Sudan and Congo DRC – these countries together make 60% of Chinese imports from Africa. China buys oil from Angola, Sudan, Algeria, Chad, Nigeria, Congo DRC, and Equatorial Guinea. South Africa provides platinum, manganese, copper and aluminum. Equatorial and southern parts of Africa provide metal ores: Ghana and Gabon – manganese, Zambia and Namibia – copper. Gabon and Cameroon export wood. South Africa provides iron ore, platinum, gold, manganese, copper and aluminum. All these countries, together, make 90% of African export of raw products to China. Chinese investment is mainly intended at sourcing raw materials to feed China’s manufacturing sector, with almost no local processing. Africans are criticizing this practice: “We lose all the job creation opportunities, because all jobs are still made by Chinese in China”, says Joseph Ohjala, senior researcher at the Institute for Development studies in Nairobi. Who and where are investing? The China’s largest private equity fund focusing on African investments is China Africa Development Fund, or CADFund, powered by the China Development Bank. According to the governmental program of expanding Chinese business abroad, CDB had created 5 funds and 3 management companies. One of these funds (2007) was CADFund. It’s focused on industrial development and the acquisition of stakes in mining interests. CADFund was allocated an overall US$5 bn, with an initial US$1 bn paid in 2007. The fund received another capital injection of US$2 bn during a July 2012 Conference of Chinese and African entrepreneurs, related to the Forum of China-Africa cooperation (FOCAC). It has reached its full US$5 bn capitalization in 2014, during Li Reqtang’s official visit to Africa. Currently, CADFund manages about 60 projects in over 30 countries in Africa, of which eight are in South Africa. Another private Chinese fund functioning in Africa is China Investment Fund (CIF) established in Hong Kong in 2003 by a group of Hong Kong investors. According to the official website, CIF’s mission is “large scale national reconstruction projects and infrastructure construction in developing countries”. It has been investing huge construction projects in Angola and Guinea. CIF was often criticized for its ineffectiveness in implementing projects. There are numerous other Chinese funds operating in Africa. There are organizations that create and manage funds, like “Heritage Resource LTD.” – a Chinese private equity fund manager. Its fund portfolio consists of 6 venture capital funds, 4 of them are focused in investments in Africa: Heritage African Opportunities, Agricultural, Educational and Mining funds. African counries seem to be attractive to Chinese private investors. According to McKinsey, the rate of return on foreign investment is higher in Africa than in any other developing region. More than half of China’s OFDI stock is in South Africa, Zambia, Nigeria, Algeria, Angola and Sudan, according to MOFCOM data. Africa might benefit from the increasing amounts of Chinese investments. Although the main China’s interest in Africa seems to be in the extractive sector, Chinese funds implement numerous projects in other fields. According to the statistics compiled by the independent researchers team of AIDdata (china.aiddata.org), from total of 1673 projects implemented by Chinese companies in African countries, 106 are in agricultural sector, 83 – in energetic, 192 – in healthcare, 115 – in transport and infrastructure, 161 in education, 215 in social sector, only 44 in mining, and 757 in other sectors, such as manufacturing. For the past few years, Chinese companies have built bridges, railways, telecommunication networks, and other much needed infrastructure. The problem is that most of the Chinese companies bring workers from China for their projects in Africa, instead of hiring local workers. “The stream of aid and investment gives African countries a unique opportunity to translate these external supports into overall gains… To take full advantage of this relationship, African governments must play their political cards well, not only as separate countries but also through the collective mechanism of the African Union”, as said in the thesis mentioned above. 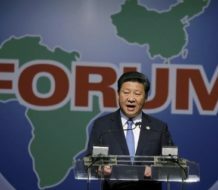 Chinese government imposes no political conditions on African governments before signing contracts either for exploration or other economic activities. Chinese funds invest even in risky ventures in politically volatile zones. China’s demand for minerals and power resources has increased world prices such as cooper, aluminum etc., which gives African budgets some extra opportunities for economic development. The new Chinese investment funds in Africa continue to form, and the capitalization of the existing funds keeps on growing. 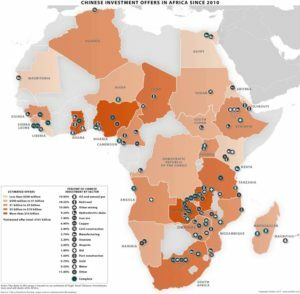 Although main purpose of Chinese investment activities in Africa seems to be the access to the natural resources that Africa has in abundance, China invests significant amounts of money in infrastructure, agriculture, manufacturing, healthcare and education as well. With proper management, African countries can have sufficient benefits from the increasing Chinese investments.